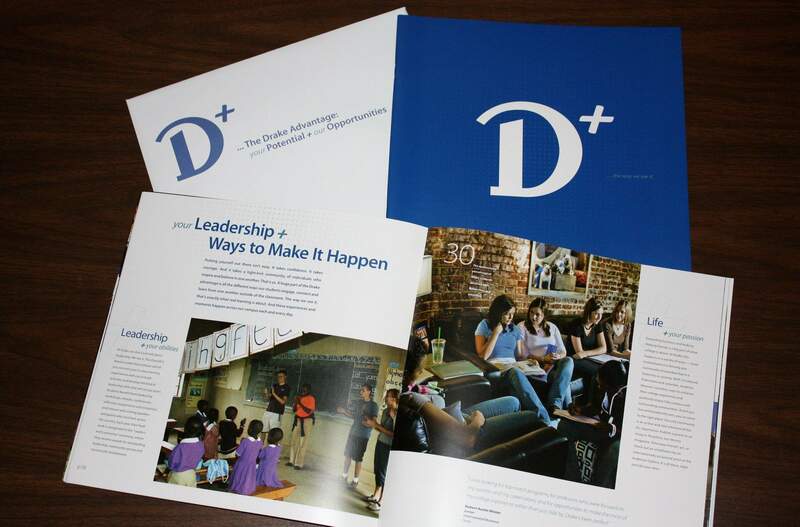 Drake University in Des Moines, Iowa, used a bold D+ on a direct-mail piece and its admissions website to grab the attention of prospective students. Drake officials didnt anticipate their daring idea angering alumni or inspiring a local store to market D+ student T-shirts. American University in Washington, D.C., is using this wonk logo to highlight the schools distinguishing traits, including politically and socially wired students and location in the nations capital. Drake University hoped a bold, blue D+ on a direct-mail piece and its admissions website would grab the attention of high school kids inundated with same-old, same-old college recruitment material. What looked like a pretty bad grade was supposed to entice teenagers to take a closer look at the pluses of attending the school in Des Moines, Iowa. Drake officials didnt anticipate their daring idea getting ridiculed on advertising blogs, angering alumni who complained on Facebook that their degrees had been devalued, or inspiring a local store to market D+ student T-shirts to amused Drake students and underachievers alike. Consider it a cautionary tale for colleges embarking on marketing and branding campaigns designed to set themselves apart in the cutthroat competition to gain prestige and grab their share of a shrinking student pool. Fifteen years ago, the term branding was virtually unheard of in higher education. The idea of selling college like a luxury vehicle or an expensive cup of coffee was viewed as antithetical to the academic mission. The new challenge may be this, as Drake has learned: When everyone is trying to stand out, colleges can no longer expect to meet enrollment targets by playing it safe. And pushing the marketing envelope carries risks and rewards. Drake officials asked for edgy and out-of-the-box when they hired Cedar Rapids, Iowa-based Stamats Communications, which specializes in higher education marketing, to help craft a new marketing campaign to high school students. The D+ was intended to introduce a more conventional campaign touting The Drake Advantage. As Drake officials saw it, their recruits are smart enough to recognize Drakes reputation is better than a D+ grade. The idea was to catch prospective students attention with a symbol that was mildly ironic, that would create a little bit of cognitive dissonance, and inspire them to go further with it, said Fritz McDonald, vice president of creative strategy at Stamats. In July, the material was mailed to tens of thousands of high school students, officials said. The D+ went up on the admissions website as well. The school said it had reason to be optimistic: Surveys of more than 900 high school students found the campaign both captured their attention and got across the concept that Drake would give them a leg up. Also, campus visits in July and August surpassed 720, a 23 percent increase from the previous year, officials said. The school reported 4,856 inquiries from prospective students in those months, a 66 percent increase. But six weeks after its uneventful introduction, the D+ caught the notice of a different audience: unsympathetic bloggers on the website The Awl and Adweek, as well as some students and alumni who turned to social networks and blogs to complain that it sent the wrong message about the university. The furor prompted school officials to send an e-mail to faculty and staff apologizing for catching them off guard and explaining the thinking behind the campaign. Across higher education, some faculty and administrators cringe at precious financial resources going to marketing, especially in down times. Earlier this year in the trade publication Inside Higher Ed, a Northeastern University official warned colleagues against seeking a quick fix from higher educations Mad Men  recession-battered retail branding consultants eyeing colleges and universities as an untapped market. Others voice similar concerns. When American University in Washington approved a strategic plan in 2008, branding was part of it. Not well known outside the Beltway or some academic circles, the school was hoping to boost recruiting, get alumni more involved and build a stronger research reputation, among other things, said Teresa Flannery, executive director of university communications and marketing. The team at American came up with the catch phrase American Wonk to communicate what it identified as its distinguishing traits, including politically and socially wired students and location in the nations capital. Being a wonk  know spelled backward  no longer means just being an insider working behind closed doors, but has broadened to mean someone who is smart, focused and passionate, said Flannery, citing the schools research of the term. 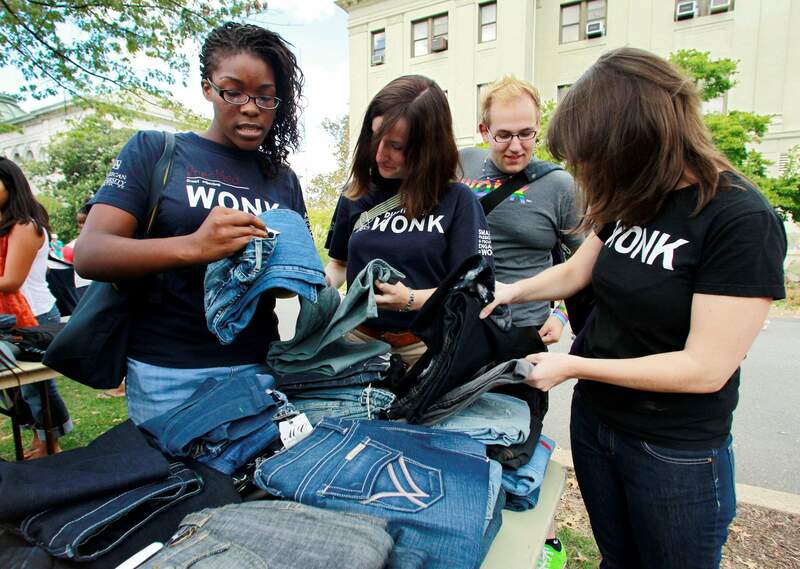 Students arriving back on campus this fall snatched up free T-shirts with 18 versions of the wonk motif, including Green Wonk and Global Wonk. Others used felt pens to write in their own wonky labels on the shirts  like their residence hall floors. But not everyone was charmed. Complaints under an online article last month in the campus paper said wonk called to mind a goose being hit over the head with a shovel or a sexual act. Flannery said the university expected a range of reactions. She said most have been positive, and American has worked to explain the campaign before taking it off campus.